Aimed squarely at the American market, the Austin A90 Atlantic Convertible was a brave gamble that did not pay off. Intended to generate a steady flow of US dollars and so satisfy the British government's ruthless 'export or die' edict, its flamboyant steel bodywork was a riot of bulbous curves, swooping lines and chrome accents. 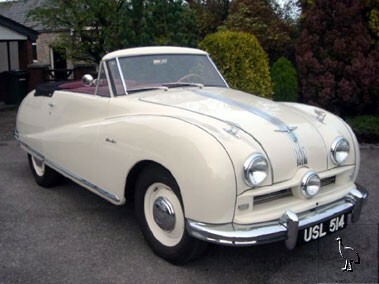 Launched at the 1948 London Motor Show, the Atlantic was underpinned by a rigid cruciform-braced chassis equipped with independent coil-sprung front suspension, a leaf-sprung 'live' rear axle and four-wheel drum brakes. Powered by a 2660cc OHV four-cylinder engine mated to four-speed column-change manual transmission, it was more boulevardier than sports car. Not that this stopped Austin from pounding one round the Indianapolis Speedway for seven days non-stop. A feat that not only underlined the model's 92mph top speed but also yielded an impressive sixty-three stock car records (the convertible in question managing to average 70.54mph including all stops over its marathon 168-hour run). Although, joined by a companion Sports Saloon in September 1949, the Atlantic failed to capture the American public's imagination or wallets (its failure ironically being blamed on a lack of 'Britishness'). Thus, by the time production ceased in 1952 just 7,981 are thought to have been made. Finished in Old English White with Burgundy leather upholstery, this particular left-hand drive example is variously described by the vendor as being in "good" (electrical equipment, four-speed manual gearbox), "very good" (engine) or "A1" (bodywork, paintwork, interior trim) condition. While, he goes on to say that the Austin was "sold new in San Francisco by the British Motor Car Company which is still trading today and retains its original dealer decals (water transfers) in the corner windshield glasses. The convertible was re-imported to the UK around 1989/1990 by a dealer and then sold to me in 1992. A 'no expense spared' but protracted restoration was carried out over a period of eight years to its present condition. The bodywork was rust-free apart from two small areas which were replaced but the engine was tired compression-wise so it was overhauled via a re-bore, fresh bearings, new pistons and refurbished carburettors. The interior was re-trimmed using top quality hide and is protected by a genuine mohair hood as originally fitted. The wheels were stove enamelled and shod with cross-ply tyres. The restoration was completed during 2000 and since then the A90 has been used occasionally and kept in a heated garage. Included with the car are some early Californian registration documents and various photos, books and magazines relating to it".